The Rebound-Free Triple Double : Blog Of The Nation Kraft Foods announced the Double Stuff Oreo wasn't doing it's job. The company unveiled plans to start selling the Triple Double Oreo soon. Three wafers, two types of frosting, lots of smiles. 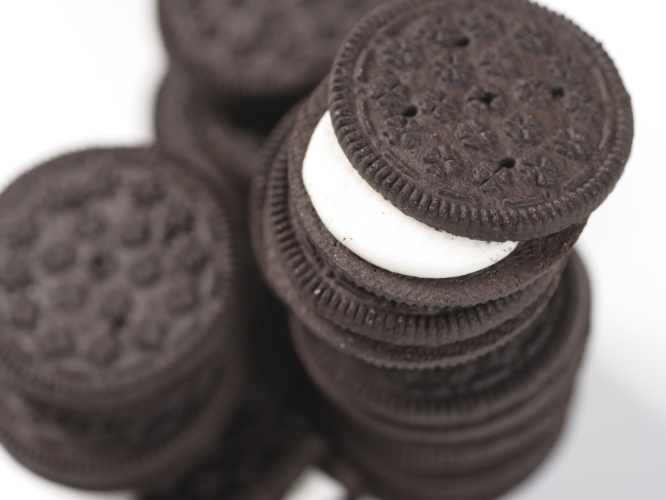 Move over Double Stuff, the Triple Double Oreo is the new over sized cookie king. It's state fair season: Last year brought Texas fried beer. We heard about fried butter in Des Moines last week. And my home state boasts root beer milk. It looks like Kraft Foods executives took notice of August eating habits. Breaking news out of the Chicago Tribune: Kraft launches the Triple Double Oreo. "Our fans' passion and enthusiasm has challenged us to raise our game," Jessica Robinson, associate director of consumer engagement, Kraft Foods said in a statement. "We are looking forward to engaging with Oreo fans as they share their twisting, licking and dunking moments with the new Triple Double Oreo cookie." No more grocery aisle wrangling over whether to buy the vanilla or chocolate Oreos. The Triple Double fixes that problem. It's got both. And three wafers. I call it Triple Delicious.